"Serve with whipped cream or vanilla ice cream to put this over-the-top!" Preheat oven to 350 degrees F (175 degrees C). Spread melted butter in a 2-quart baking dish. Heat peaches, 2/3 cup sugar, and water in a saucepan over medium-high heat, stirring occasional, until slightly thickened, about 5 minutes; remove from heat. Mix flour, 1 cup sugar, milk, baking powder, and salt in a bowl until batter is combined; pour over melted butter in baking dish. 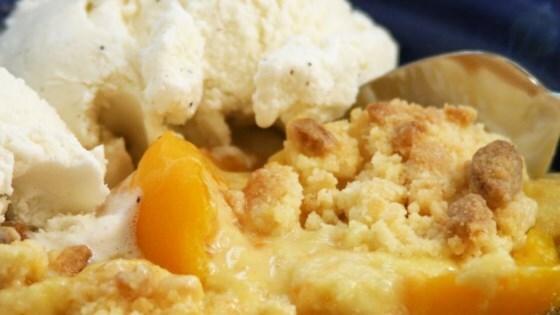 Arrange peaches over the batter and pour any remaining liquid on top. Bake in preheated oven until golden brown, 40 to 45 minutes. This was husband approved, so I will make it again!